Sarah Pucill Interviewed by Elisa Adami and Alessandra Ferrini about her latest film, Magic Mirror. 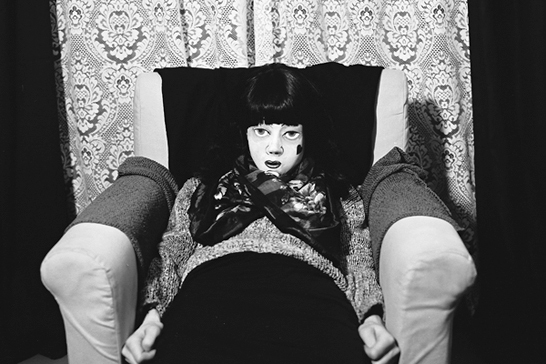 Part 1 of the interview, a conversation about Claude Cahun, is accessible here. AF: I’m very interested in the process, in the way Magic Mirror came about. You worked simultaneously with images and words, while exploring the links between these two media. You both re-staged Cahun’s black and white photographs and pulled out extracts and quotes from her book Aveux Non Avenus. As you have mentioned this text is very complex and dense. What kind of criteria did you use to extract the quotes? SP: Well, I have selected only a fragment from the whole book. I read it over and over and I selected the key bits. The criteria for selection incorporated different concerns. For instance, I selected certain parts just because I thought they were powerful lines. The complexity of her writing could suggest that Cahun doesn’t take a political position so I wanted to highlight moments where I think she speaks about social inequality whether about gender, race, social class, or her being Jewish. I would say she acknowledges and raises the issue of social difference and division with some removal, without being on one side batting the other side. She is playful, often contradictory and cryptic. I selected other bits of text because I could see how they related to her images, either to a particular one or generally to her way of making pictures. Sometimes I selected quotes because they resonated with the same concerns that I have worked with in my films, such as the idea of the ‘glass’, the ‘mirror’, and ‘inside/outside’. Practically, I cut the text up into pieces and organized them thematically. I knew that the film was going to be long and I wanted it to be watchable, to give it a coherence that is less apparent in the book. So certain quotes refer to a particular image, others to a theme: for instance, there is the Narcissus theme, the pastry kitchen scene, the bedroom scene, the sea and the beach. My feeling was that Cahun’s writing is deliberately cut up. At the beginning of each chapter there is a photo-gravure which is a combination of photographic and drawn lines. (Susanne Malherbe her partner drew the images). So the theme of cutting up is very much there, also at an aesthetic level. Reading Aveux Non Avenus, I had the impression that she first wrote the text and then cut it up and re-positioned the fragments. To some extent, I think I put the pieces of text back together, so I have introduced some coherence. EA: One of the most recurrent themes is probably the ‘movement through the mirror’. Can you please tell us a bit more about this? SP: Many different references and influences are entangled in it. The image of the mirror and of the movement through the mirror owes much to the Surrealists, of Lewis Carroll, Jean Cocteau, Maya Deren. I was directly inspired by Cahun’s photographs and her writing that both seemed to tell the same story.. But, in the construction of that scene, I was also referencing one of my early films, Cast (2000) which I made 12 years ago. In Cast, I stage a movement through the mirror which becomes a metaphor for a lesbian encounter. 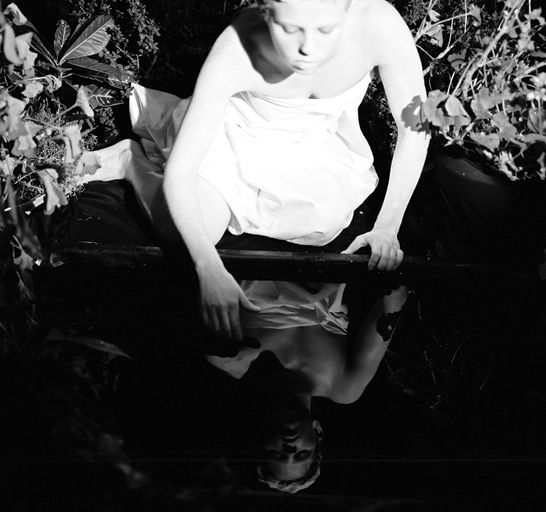 The film was inspired by three images of Cahun (Cahun looking in the mirror, Susanne Malherbe looking in the mirror and Cahun dressed as a little girl asleep and hiding in a cupboard). There is an exact scenario combining the mirror, the lesbian encounter and the footprints on the sand which is in Cast and is also present in Cahun’s text. It’s a sort of coincidence, but then it’s not, because in the end we are all sharing collective experiences. EA: I can see the same movement, the same tension of ‘going beyond’ also in the Narcissus scene. In this case, rather than a ‘lesbian encounter’, you are staging the encounter with the self, with one’s own image. EA: Going back to the selection of materials for your film, you mentioned that you had chosen bits of text and images that were related to your own artistic research and practice. I guess it was quite easy to find these resonances, because it is evident that you share similar visual ideas. Mirrors, for instance, are a recurrent element, almost a feature, in many of your films. I’m thinking for instance of your films; Stages of Mourning (2004), Taking My Skin (2006) or Phantom Rhapsody (2010). Also thematically, you both share similar interests and lines of enquiry: investigations on the gendering of the self; the image of the self as other, a mirroring between women (as lovers or mother-daughter) the fragmentation and splitting of identity, to name only a few. SP: Yes, that’s right. Because of the process of selection and recombination of the material, because of the way I have juxtaposed images and writings, the film ended up being an examination of the relationship between Cahun’s photographs and texts. On the other hand, because I selected themes related to my own research, it ended up also being an exploration of the relationship between my work and Cahun’s. There are undeniable similarities between our works. I suppose that the most important things are the ideas we share. I wanted to engage with Cahun in a side by side relationship. In Magic Mirror, there is an element of Cahun scholarship but, it is not a documentary. I wanted to create a discussion, to share a conversation with Cahun, with her work. Our shared concerns include the mirror and glass, Narcissus, the splitting of self, self as Other, subject/object collapse, self as inanimate, ambiguities between gender, living and animate, transformation of self, even self-contradiction, theatricality and hiding. This discussion was generated from a feminist place, from a queer place. I was working through ideas from that position, from a place of difference you could say broadly gender or politics of difference. The fact that as artists, we share similar concerns helped in establishing a connection. EA: You use the term ‘collaboration’ to describe the relationship you had with Cahun and the way in which you made Magic Mirror. That’s a peculiar, let’s say provocative way, of putting it. Can you please expand on this? SP: I got this idea in part from my late partner Sandra Lahire who made a trilogy of films drawing on poems by Sylvia Plath. She always insisted in saying that this was a collaboration: she was making images from Plath’s poems. I used the term collaboration provocatively, but I think this is actually possible. If an artist has left words and images, I can come in with the medium of film and start a conversation, a collaboration with her/his legacy, in the same way as if a musician leaves a piece of music, another composer can play it which necessitates an interpretation from the script on the page to its manifestation through sound. The still image is turned into the continuous present of time which encompasses movement and sound too. So through the transition into a different medium, translation takes place, interpretation or re-interpretation. It is in the point of transition into a different medium, from the still to moving that the collaboration takes place. The lens tracks the eye, the mouth, the lines skim the skin surface. The expression on the face is fierce, at times tragic, at last calm, with the carefully constructed knowing calm of an acrobat. A professional smile and voila. The lipstick and eye-shadow. A moment full stop. New paragraph. An association is made here between the rhythm of the sentence and the rhythm of a moving camera. She is working with word and image but also with movement. 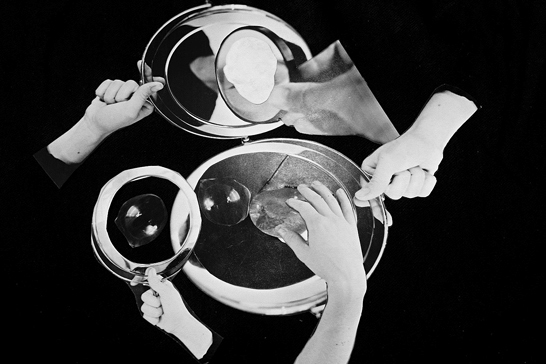 The idea of movement is evident also in her photo-collages. I have the feeling she wanted to move her images. And that’s what I’m doing: I set in motion these pictures. So, to say that I’m re-staging them is not correct. My images are tableaux-vivants, they move and breathe. I am animating them, giving them life, time, performance, movement and sound. The sounds are very important. They serve to animate the written words. I have tried to make explicit the idea of multiplicity of identities present in Cahun’s book by using multiple voices and performers. There are several performers, and their make up is so strong that it’s almost impossible to distinguish them, so the faces keep changing. I have done the same with the voice: there are many voices slightly altered, sometimes speaking alternatively, sometimes together. My film is not just word and image, but word, image, sound and movement. I’m giving movement and sound to Cahun’s work. I’m extending it, but also speaking back to my own work, as much as to Cahun’s work. That’s why I consider Magic Mirror a collaboration. AF: I had the strong feeling that you had managed to establish a form of personal connection, a kind of contact with Cahun. I don’t know if I should use this word, but I had the impression of a ‘transfer’ between author and character, between you and Cahun, the Self and the (mirrored) Other. You have gone beyond Cahun’s photographs, as you said, you went through the looking glass, establishing a spatial relation with Cahun: while re-staging the images you are behind the camera, connecting to Cahun by inhabiting the same space. SP: Yes, I said that specifically: what does it mean to actually go into the place of Cahun? Instead of looking at the photographs, I’m going through to the other side, whether it’s me performing or not. That’s because I did set it up, I’ve made the costumes and the make-up, redone the lighting and found out the camera angle. It is like going to the other side of the glass, where she was looking back out at the viewer. And in this special arrangement there is a sense, for me, of a collapse of time, where you actually go back in time and meet the moment the photograph is taken: it’s like a meeting point. By re-staging Cahun’s images, I have learnt more about them. I could more fully understand the reason why she set them up a certain way, or, for instance, why she used a black background. I was able to experience what it would feel like to be there wearing those costumes. This was possible through the process of re-enacting, which is often described as a ritual or something that comes close to a ritual, in which there is no talking or looking involved: you just do it. You sit there, you put on the garb. And in doing that, what you feel and think is also affected. So there is something about this performance element that is like an enactment, a life moment. It is lived and performed, one could say that it is separated from representation. The moment you dress up and perform, this experience becomes part of your life, and you cannot set them apart. In this way, you are bringing whatever element you are re-enacting into another time, and maybe that is why it could be understood as a ‘ritual’. EA: Did Cahun ever use a moving camera? SP: No as far as I know she didn’t at all. You had to be very wealthy to have a moving camera then. After the war and their imprisonment of her and her partner Susanne Malherbe they were quite poor. But the book does anticipate the moving camera and the gramophone which had just been invented. In many respects, there are allusions to the moving camera that occurs in the writing where the camera moves with her sentences, but also the merry-go-round structure of the book (that I adopt for the film) and the photo-gravures which look like photo-montages that begin each so-called chapter (which doesn’t operate as a chapter in any linear way at all). I have re-staged photo-montage images at the start of each ‘chapter’ or ‘scene in a play’ that are then animated… In many ways this kind of photo animation speaks of early cinema. Her book speaks of the language of cinema to come that actually is still to come in the sense of the possibility for a non-linear cinema. EA: Did you consider re-staging Cahun’s pictures by performing yourself? SP: I did want to. I’m only in one of the scenes. Initially I was in more tableaux, but I had to be behind the camera to watch and control what was happening. Although I didn’t actually perform, its strange but I feel my presence is there in the performance. I did the camera, the edit, the sound, assisted with the costumes, the text, the voice.. so I have ended up feeling I’m in every bit even though of course its also a collaboration with everyone working on it..
AF: I think that in some parts of your film, the question of authorship becomes very blurry, especially in the tableaux which featured doll-like characters. The performers’ identity is hidden and anyone could have been behind that mask. It could have even been you. This is something that as viewers, we cannot know for certain. This brings me to ask you about the very personal way in which you have connected to Cahun’s archive. Could you expand on this please? SP: Yes, my approach is very personal and, simultaneously, it plays with ideas of labour. I chose to make props by myself – you can see that they are handmade. I wanted to be involved with it. It’s a bit like touching or getting closer to the work, or probably, as you said, it is about empathy. Being a small production really helped maintain a high degree of intimacy. If it was a higher level production with a big crew, you end up with a professionally made but generic, mainstream production which is not going to have that handmade feel. I would have had just a directing role, not a personal relation to Cahun’s work. The whole thing wouldn’t have been the same, I wouldn’t have felt the same closeness to her work. I think that the make-up and the poses in her images are very sophisticated and serious. The costumes, on the other hand, vary between being amateurish and not, while the lighting is very simple. The camera and the lights are always in the same position, and often the frame is just out. So Cahun’s photographs have both a sophisticated and a makeshift element. She is working between the two. (She celebrated the idea of being an amateur in relation to her photographs.) That’s why it has a miraculous kind of look. You are stunned: that’s its strength. It’s so simple and you can see her bedroom curtains in the background. For Magic Mirror I had a good camera and good framing, but it was actually a very low-budget work. It was made in a small place with minimal props, unsophisticated costumes but skilled make-up. I have screened off part of my home with curtains in the same way that Cahun did. I could have decided to go in a studio. I actually wanted to follows similar production method by filming in a domestic space. At the same time it’s not a domestic video, it is staged and photographed with proper lights, shot on 16mm b/w so it’s kind of in-between, it is well lit and framed, it is black and white celluloid, the images are seductive, but if you look in the corners, there are drawing pins and things like that, there are dots and dirt in the mirror, which is all part of that production. EA: What is it about the re-staging from Cahun’s archive that is important for you, as opposed to using Cahun’s actual footage? SP: I think there are definitely interesting things that can be done with the archive especially moving image footage where re-cutting or changing the sound changes the whole thing but the approach I’ve always taken in my work is to re-create. and I enjoy that, it’s a journey I haven’t finished with. I chose to recreate the archive by re-presenting it through re-staging. But I think to re-stage photographs into the language of film opens up a whole semantic field because movement and sound, voices, performance, music etc can all be brought in. So for me there is something very particular in the transition from the still image to the moving image which could only be done if it is re-staged. Many of the scenes in the film come from a single still Cahun image. The difference in the shift to cinema is that it isn’t live so it is a unique possibility I think. The fact I have been able to add voices that speak lines from the book, dialogue, monologue alongside her images is almost about putting back together what was never together in the first place. The words and image have come from the same place which is Cahun. In moments they say the same thing, such as her writing that describes the analogy between her own reflection in the mirror with that of her gaze towards her partner, which matches the two photographs of her looking in the mirror posed and framed exactly the same as its twin photograph of Suzanne Malherbe looking at herself in the mirror. In the film I bring these separate mediums (photography and writing) together. Here, Cahun’s transition through the mirror ‘as writing’ which she describes as a lesbian encounter is stitched to a re-staging of her photographs that clearly come from the same psychic ‘place’. In this way, I am putting back together in film a unity that has come into being only after her death, in fact now. So this joining has two time-spans, one in the past which is the source of the work, Cahun and to an unknown degree Suzanne Malherbe too, but also in the present in the form of this film in 2013 where the material joining occurs as cinema for the first time. Magic Mirror will be screened at the ICA, London, on the 7th and 8th of December 2013.